I have come to Veggie Truckin’ to write about two topics tonight: my food truck experience at Treasure Island Music Festival and my love for pumpkin flavored food sold at food trucks. The weekend before last was the Treasure Island Music Festival. I ended up going on a whim with my boyfriend to the Saturday show, and this unfortunately meant missing my usual Moveable Feast tradition on Saturdays. On the plus side, there were food trucks at the festival, and most of them were San Francisco based trucks I had never even heard of! My boyfriend and I shared food from two different trucks. Our first stop was Fogcutter, a truck that, according to my research, was previously called both Brunch Box and Bandit Truck. Despite the many name changes, Fogcutter’s food met my standards. 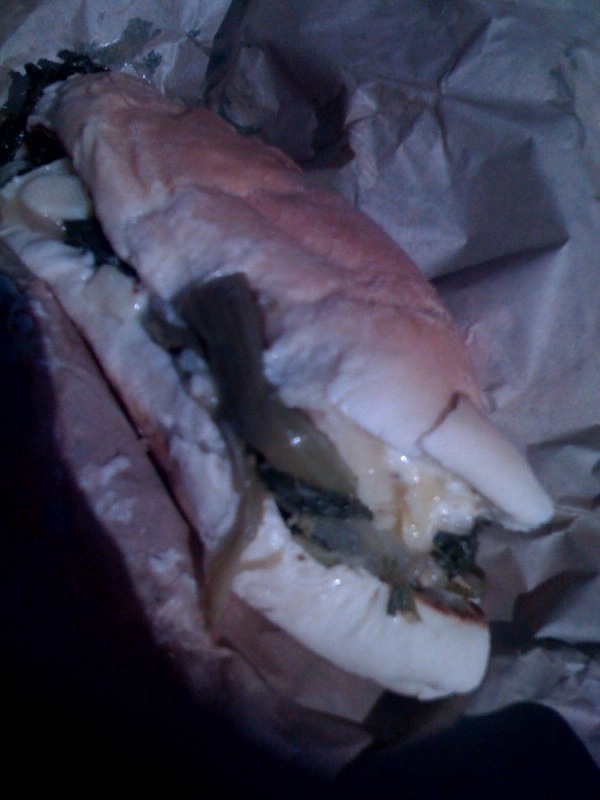 I can’t find the item I had on their menu, but it was a sandwich with cheese and broccoli inside, and it was unlike anything I had tasted before. Sadly, the photo I took didn’t come out great in the sunny Treasure Island lighting. 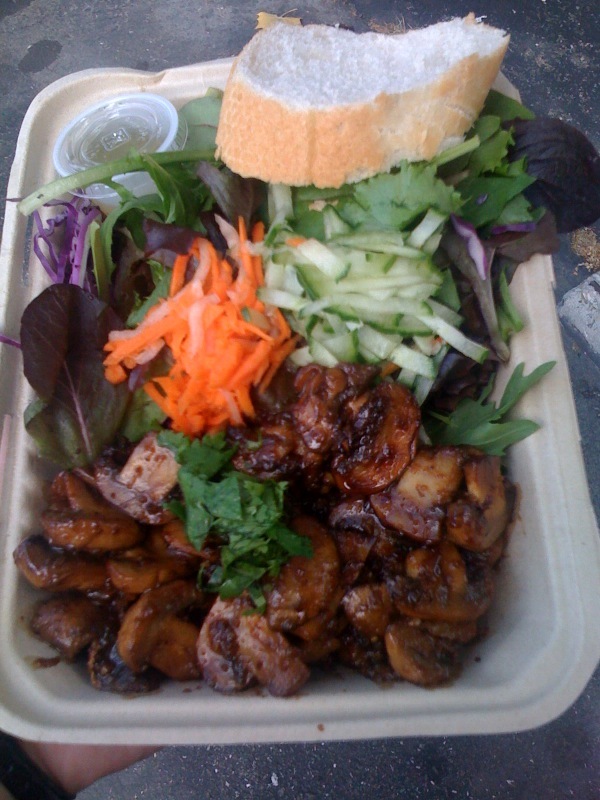 Meanwhile, my boyfriend grabbed his lunch at Eat Curbside. And now…. my love for pumpkin. Like many people, I look forward to fall for a couple of reasons. One is the sound of leaves crunching under my feet when I walk. The second is pumpkin flavored food. I can’t get enough of it. If pumpkin stuff was sold year round, I would eat it year round. I just had some pumpkin cream cheese while drinking pumpkin ale. I’m obsessed. This obsession overlaps well with my food truck obsession because many trucks choose to add special seasonal pumpkin flavored food to their menus. And then I rejoice. 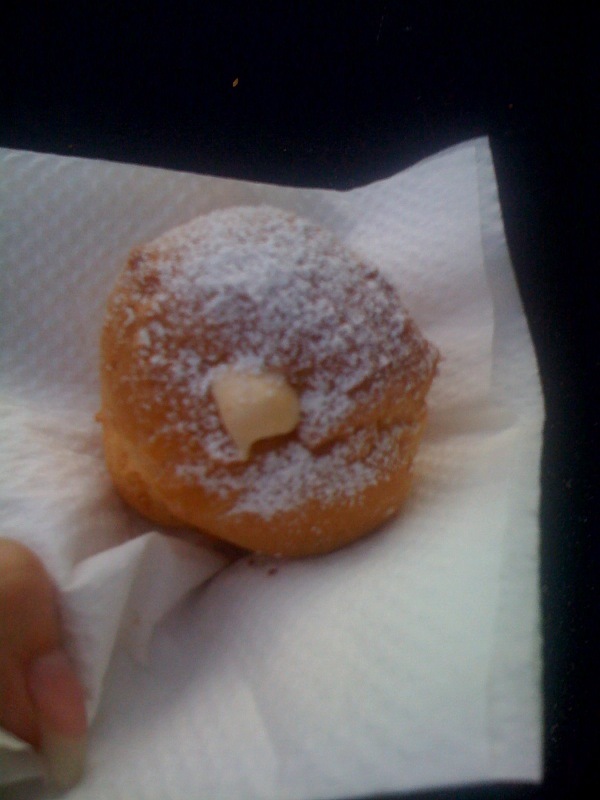 The first pumpkin flavored treat I had from a truck happened at the final San Mateo Moveable Feast earlier this month. Pacific Puffs was serving a special pumpkin puff that was filled with pumpkin flavored cream. The gentleman who sold it to me warned me that the cream would explode all over me when I bit into it, but I was still surprised when that’s exactly what it did. The flavor more than made up for the mess though. Another special pumpkin menu item that I’ve had more than once now is the That’s Sweet! Dessert Truck‘s pumpkin spice cupcake. 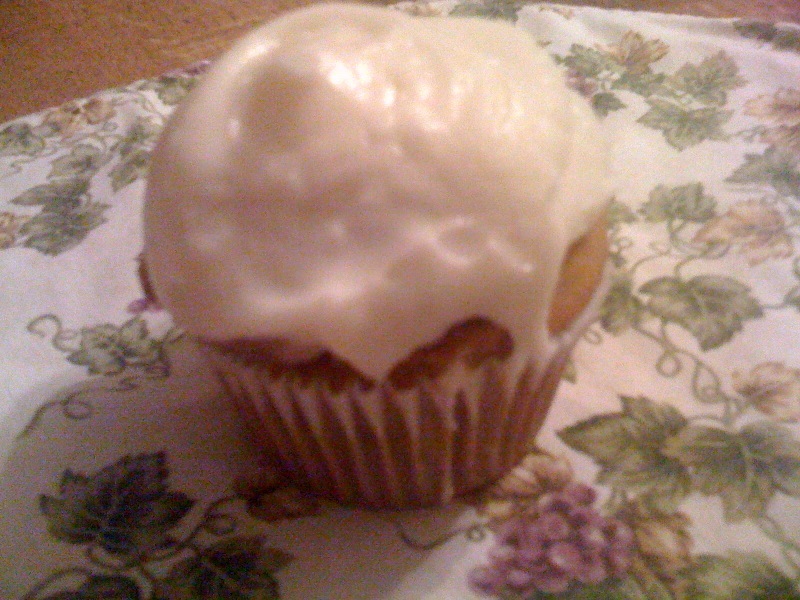 Pumpkin spice cupcake from That's Sweet! There’s something about the mixture of pumpkin and cream cheese that can’t be beat. It is also worth noting that the gentleman who runs That’s Sweet! recently told me that they discovered a problem with their ovens, and now that it’s fixed their cupcakes (which I loved before) are better than ever. 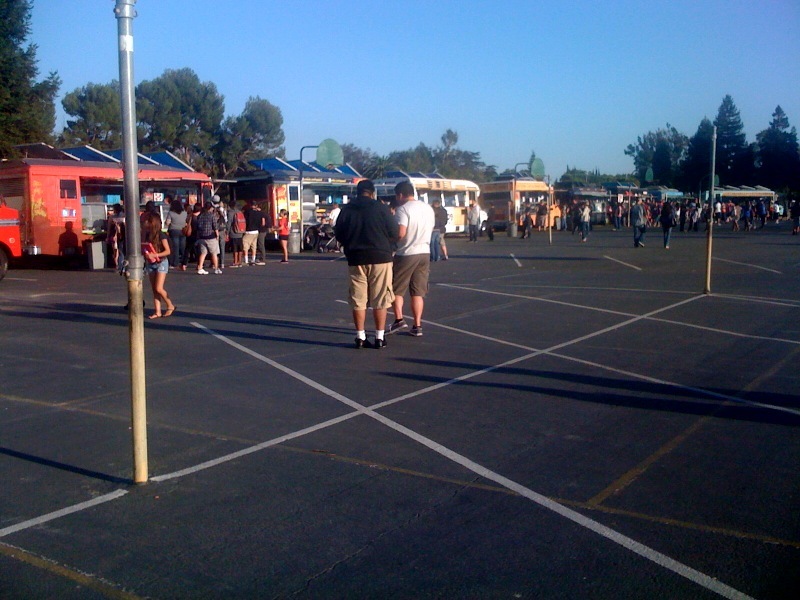 The final pumpkin experience I had was at the debut of Feast at the Flea, a new event where food trucks meet at the San Jose flea market parking lot. After enjoying a dinner from O Mi Ninja, I headed over to Treatbot for an old favorite from last year. I had been waiting for the return of their pumpkin flavored ice cream, and this was the first event I went to where it was served (although they had been serving it all week). 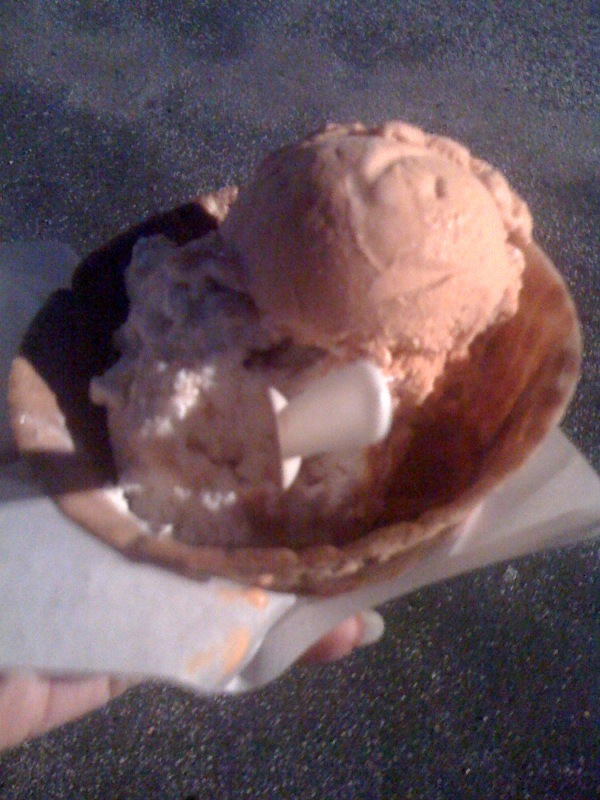 I chose to get my pumpkin ice cream in a waffle bowl with their apple pie ice cream. It was like Thanksgiving dessert a month early. Although these three pumpkin flavored treats were great, I’m on the hunt for more. 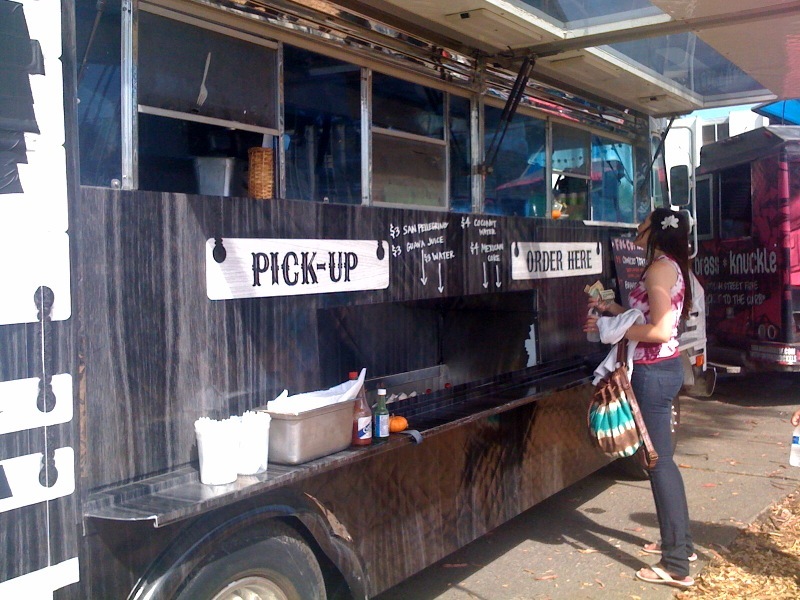 Do you know of any trucks in the south bay serving special pumpkin flavored options this fall? Please let me know so I can hunt them down! First, I went to the Moveable Feast that took place at TechShop for their grand opening. I went to two trucks I knew about but hadn’t been to before. 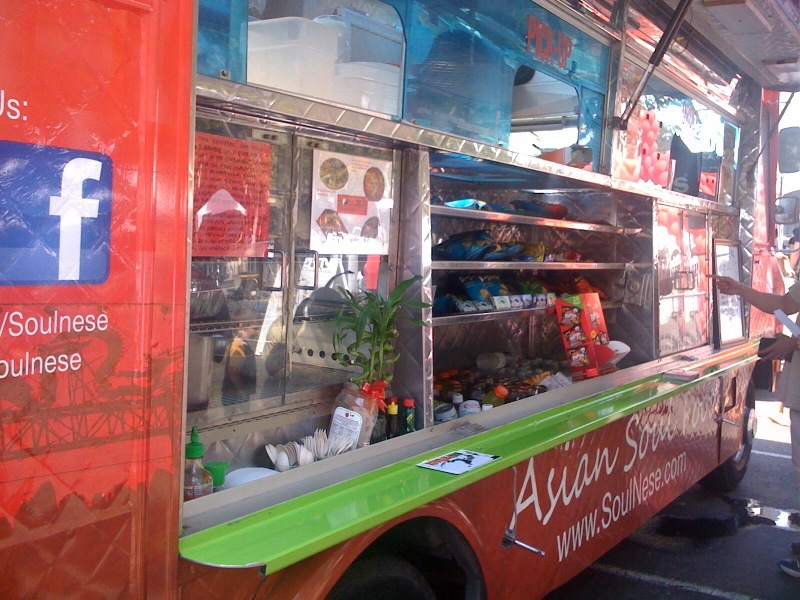 First, I went to Soulnese, a Chinese comfort food truck that only has one vegetarian option. That one vegetarian option was mac and cheese egg rolls that I had had my eye on every time I’d previously seen them but hadn’t had a chance to try. They required double lactaid and made it so I had to skip my original plan of following the egg rolls with a toasty melt, but they were worth it. 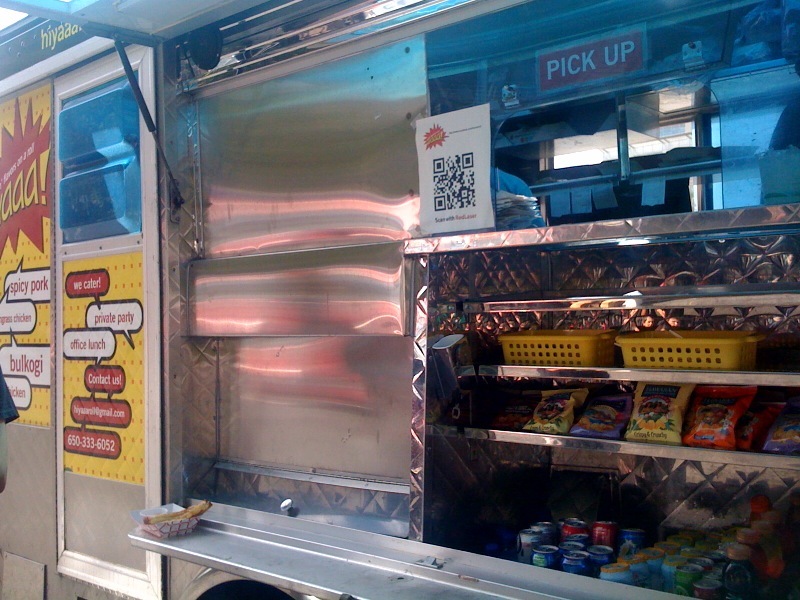 My next stop was Hiyaaa!, a truck I’ve known about for months but never tried. I had avoided them because their vegetarian options are heavy in mushrooms, and as anyone who’s read this blog at any length knows, I have very mixed feelings about mushrooms. Since I was already dairy-ed out from my mac and cheese egg rolls, the only vegetarian option left was Hiyaaa! so I decided to take a chance on the mushrooms, and I’m glad I did. I got the vegetarian salad, and although there were a lot of mushrooms, they were seasoned so much (and so tastily) that they hardly tasted like mushrooms at all. 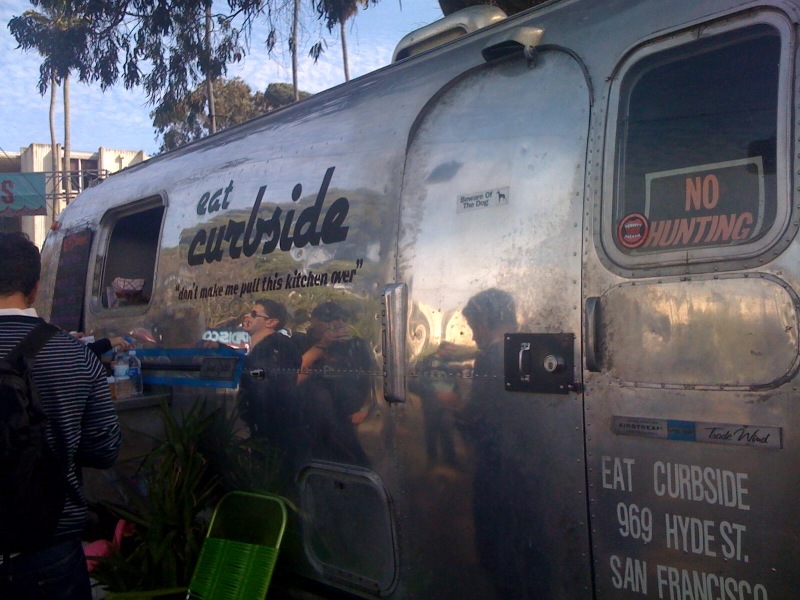 That weekend was also the Eat Real festival in Oakland. It lasted all three days of the weekend, but I planned to attend on Sunday. It was the first gloomy, rainy day of the fall, and I realized about halfway through my time there that it was only making my cold worse. That didn’t stop me from enjoying yummy food though. I first went to Liba Falafel again since it is so rare I’m at an event where they’re serving. This time I tried their vegetable tempura, and it started the day off right. 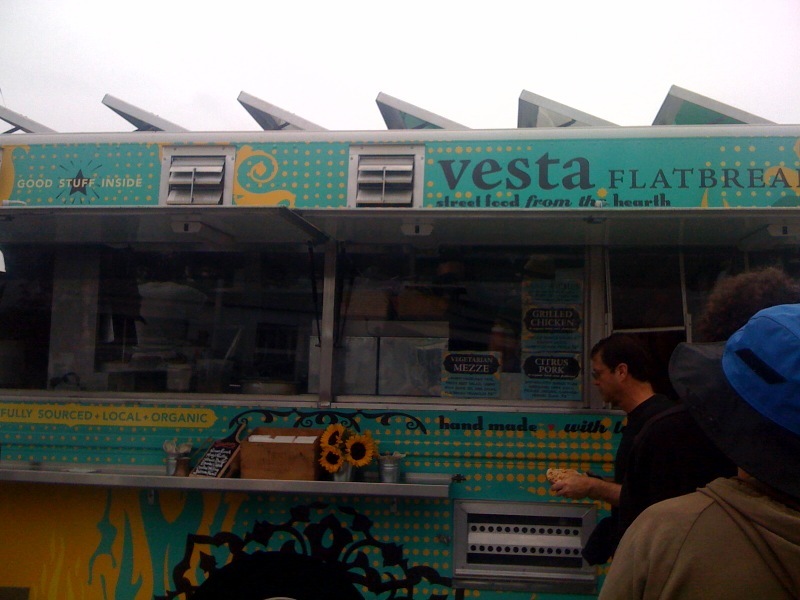 My next stop was a truck I had never heard of before, Vesta Flatbread. I got the one vegetarian option they were serving that day not knowing what to expect because I had never heard of and couldn’t pronounce most of the ingredients it contained. However, I was met by amazing flavors and some of the freshest bread I’ve ever eaten. I next went to the Scream Sorbet booth. I had been hoping to try them since I first started using Roaming Hunger over a year ago and always spotted them in the east bay. 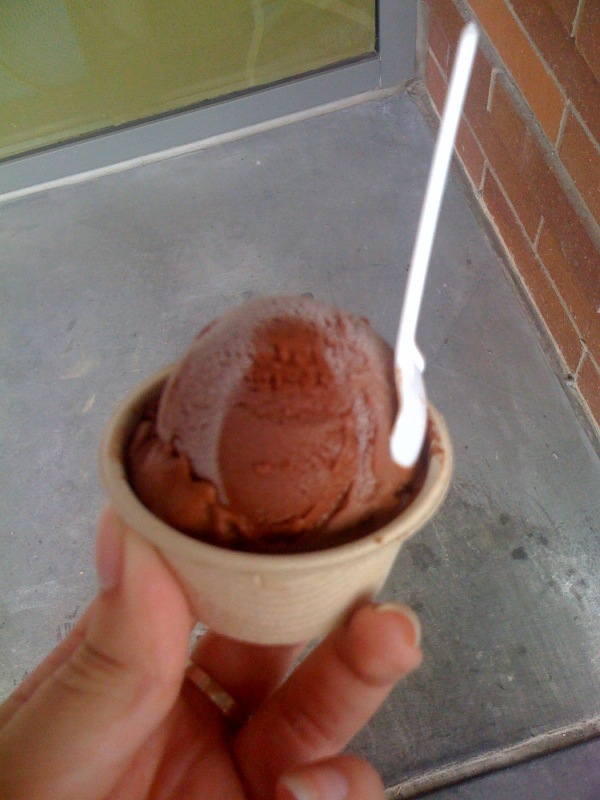 This was the first time I’d come across them, and I was happy to discover that all of their sorbet was dairy free. I got the chocolate option and it enjoyed it inside since it was already so cold outside! 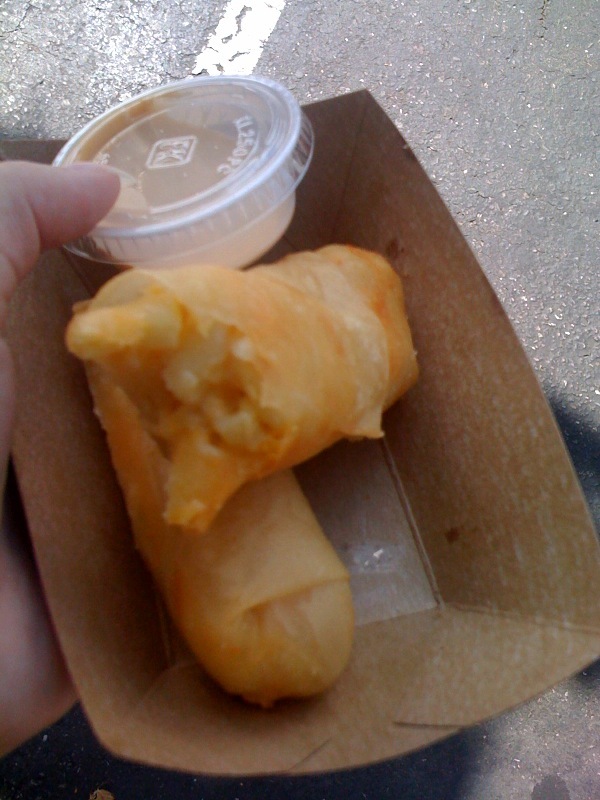 My final stop of the festival was the Tru Gourmet Dim Sum booth where I got an order of vegetable egg rolls. After this, I was sufficiently full and ready to get out of the cold for good. By the following weekend, my cold had mostly gone away, so I don’t have to look at any of those food truck experiences in retrospect with regret. Friday the 30th I went to my first Word on the StreEatz (although the second they had held) at Cabrillo Middle School in Santa Clara. 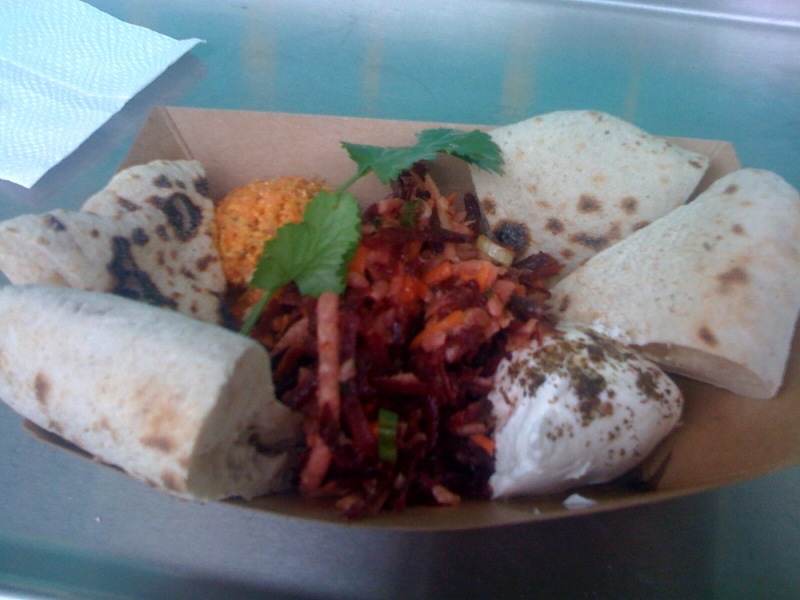 I got my dinner from Babaloo, a truck I had eaten at before but not since I became vegetarian. 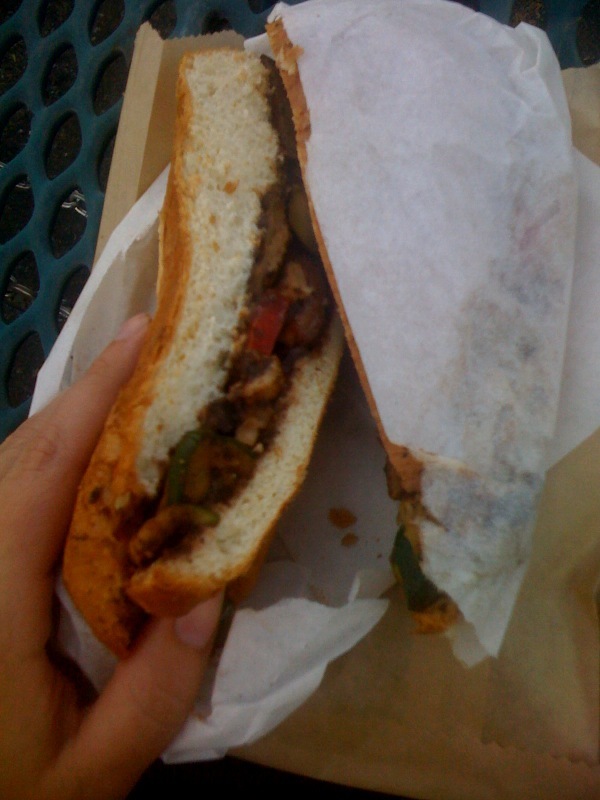 I got the Babaloo itself which was filled with black bean humus, mushrooms, and peppers. It was delicious. 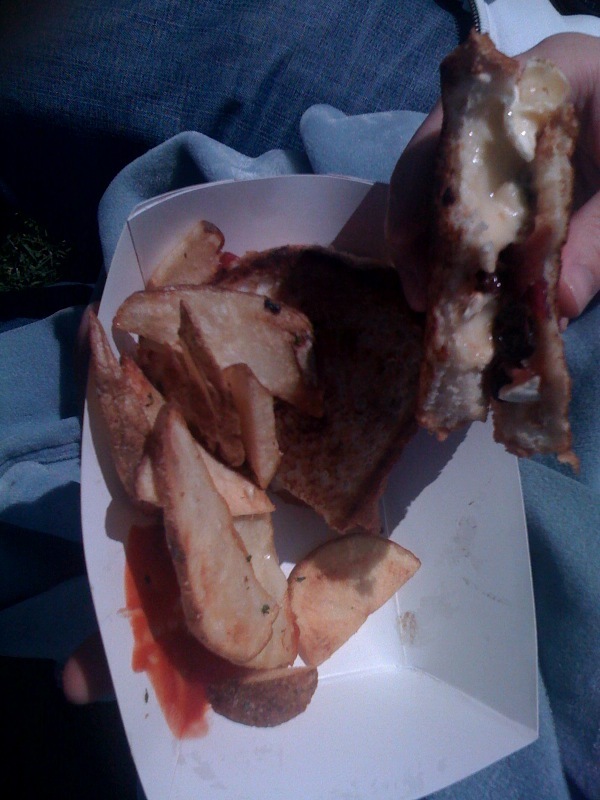 On Saturday October first, I ventured to another Moveable Feast. 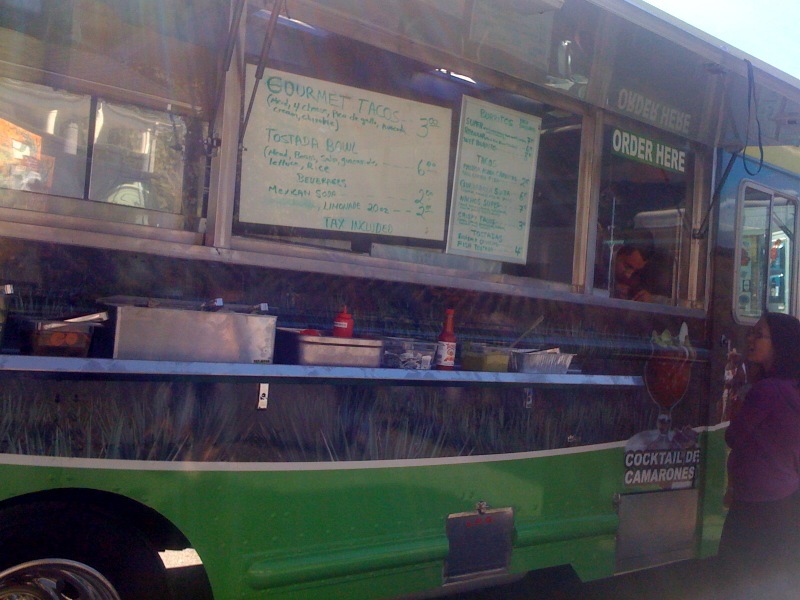 This one featured another truck I hadn’t heard of, Tacos de Los Altos. I haven’t been able to find a website or twitter account for them either. They didn’t have any vegetarian options on their menu but were happy to make a vegetarian burrito when asked. The truck also had a full spread of salsas, guacamole, and other toppings that could be added and came with tortilla chips. It was very filling! 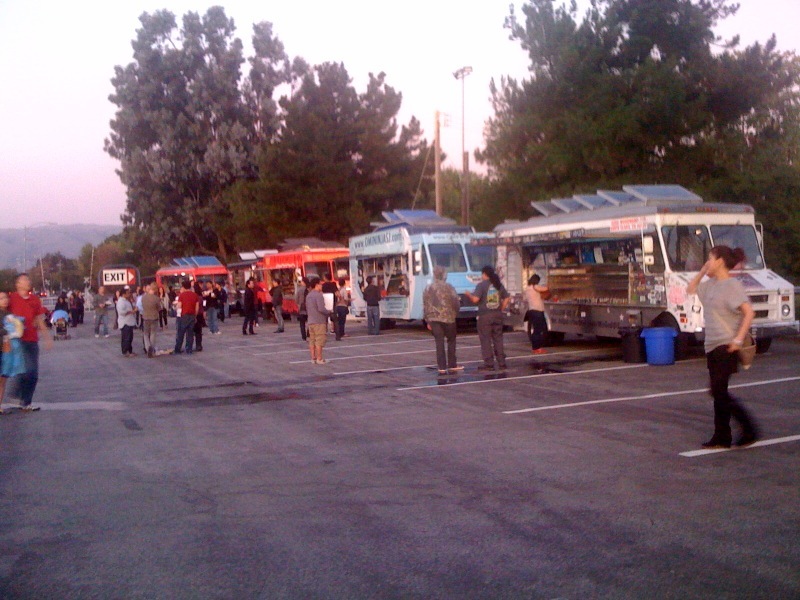 With the weather getting cooler, many of my favorite food truck events are ending or becoming monthly instead of weekly. 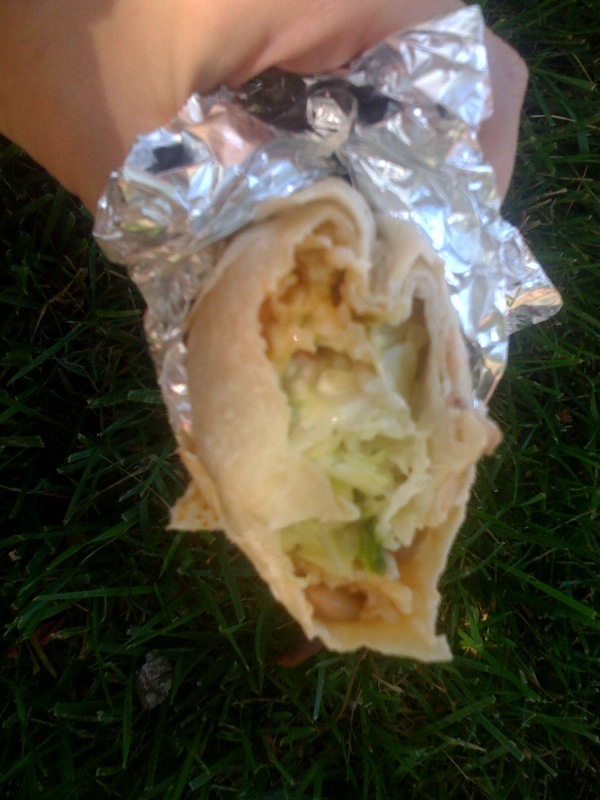 The visits might become less frequent, but I still plan on eating at trucks whenever possible. The good thing about living in California is not having to worry about the weather being too too cold. 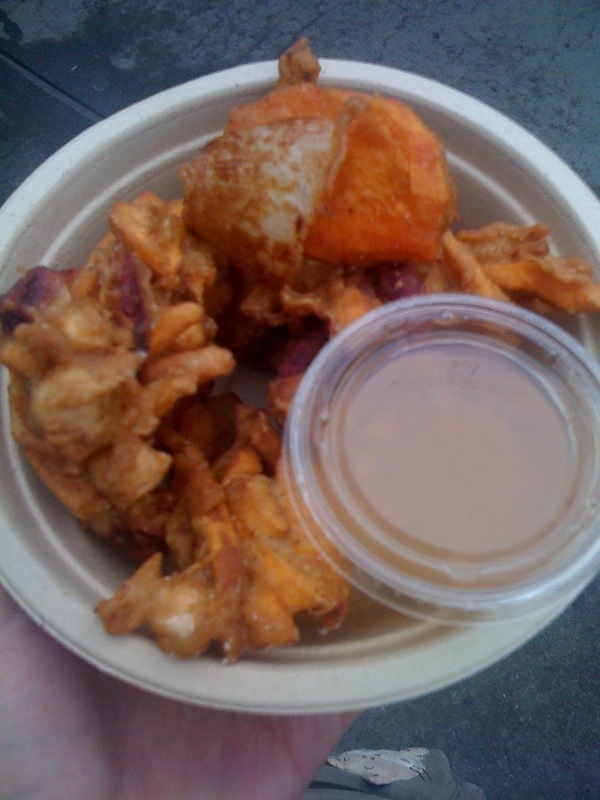 I’m especially loving when food trucks add pumpkin flavored options to their menus!